When visiting Mexico recently, we found a little gem in the heart of Puerto Vallarta called Salud Super Food. They had tons of delicious smoothies, perfect oats, and bowls. Their Mediterranean quinoa bowl struck my eye one day, and I’m so glad I gave it a try. The veggies were perfectly seasoned and saucy, and I managed to get my daily serving of greens in one bowl! But my biggest takeaway? They’d gotten the quinoa perfectly crispy, almost like it’d been cooked and then stir-fried to get that crispy golden crunch. 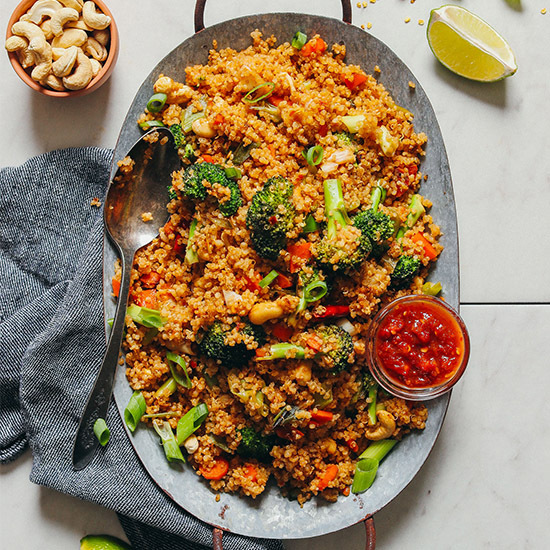 ‘Ding, ding, ding!’ A light bulb went off in my head for “quinoa fried rice” and one of the first things I did when I got home was get in the kitchen and test this recipe. Good news! It totally worked. Let me show you how easy it is! This dish requires just 10 ingredients and less than 30 minutes to prepare when your quinoa is prepared ahead of time. If you’re like us, you have leftover quinoa in the fridge most days. 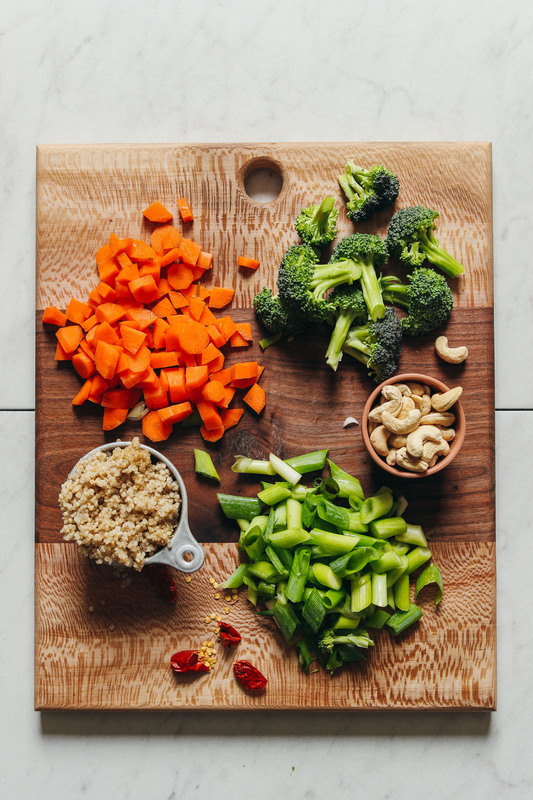 Chopped vegetables get sautéed while you mix up a delicious almond butter-based sauce with coconut aminos for depth of flavor, lime juice, and maple syrup. Dried chilies or chili garlic sauce add a bit of heat, while chopped green onion adds freshness and a pop of color. 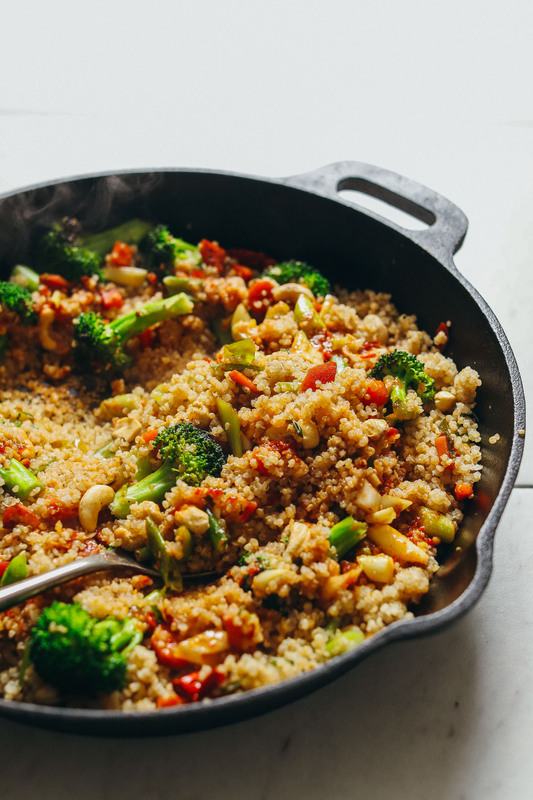 Once your veggies are tender, simply add your quinoa and sauce and stir-fry until the quinoa is nice and crispy! We hope you LOVE this dish! This would make the perfect weeknight meal – or one to make ahead of time and enjoy as leftovers. For a little more crunch and staying power, we added some cashews. But you could also add something like Marinated Peanut Tempeh or Crispy Peanut Tofu! 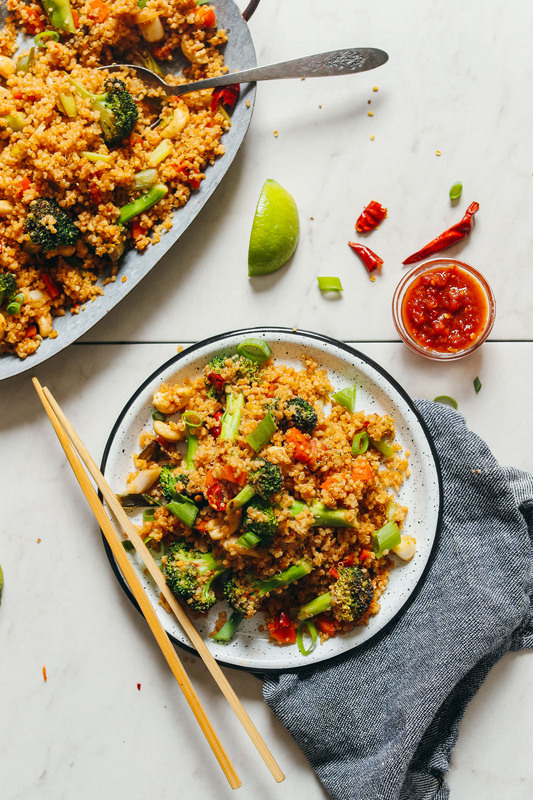 If you’re into this dish, be sure to check out our Vegan Fried Rice, 30-Minute Cauliflower Rice Stir-Fry, Almond Butter Tofu Stir-Fry, or General Tso’s Tofu Stir-Fry! 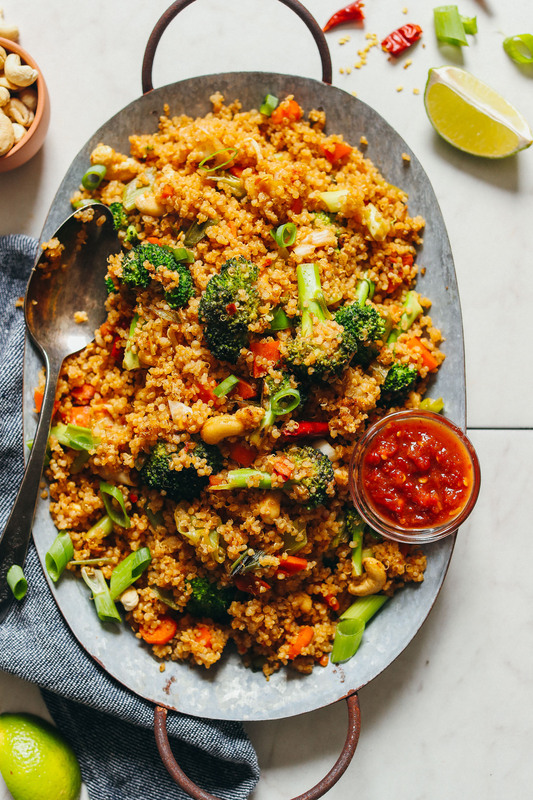 Delicious, hearty quinoa "fried rice" stir-fry with broccoli, carrot, and a sweet-and-spicy sauce! Ready in less than 30 minutes, big flavor, and incredibly satisfying! If you haven’t prepared quinoa yet (*prep/cook time does not include making quinoa), do so first by adding rinsed quinoa to a large saucepan and toasting over medium heat for 2 minutes. Add water and bring to a boil. Once boiling, reduce heat to a simmer, cover, and cook for 18 minutes or until water is absorbed and the quinoa is fluffy. Transfer cooked quinoa to a glass bowl or storage container and refrigerate (uncovered) to cool. Once completely cooled, cover. Will keep in the refrigerator up to 1 week or in the freezer up to 1 month. 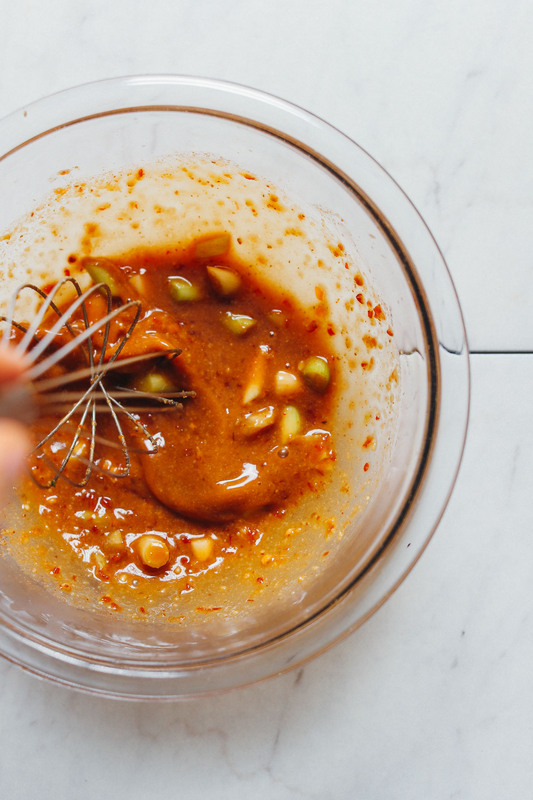 In the meantime, prepare sauce by adding all ingredients to a mixing bowl and whisking to combine. Taste and adjust flavor as needed, adding more chili garlic sauce for heat, lime for acidity, maple syrup for sweetness, almond butter for nuttiness, or coconut aminos for saltiness and depth of flavor. Set aside. Heat a large skillet (or wok) over medium-high heat. Once hot, add sesame oil (or water), carrots, and one third of the coconut aminos. Cover and cook for 3-4 minutes, stirring occasionally. Carrots take the longest to cook through, so they need a little time on their own. Next, add chopped green onion, broccoli, and cashews (optional), along with another one third of the coconut aminos. Stir, cover, and cook for 2 minutes or until broccoli appears slightly browned. Add cooked quinoa and the remaining one third of the coconut aminos. Stir to coat and cook for 1 minute. Then add sauce and stir. Cook for another 4-5 minutes, stirring occasionally. You want the quinoa to have a chance to sit at the bottom of your pan and get crispy. Serve as is, or garnish with additional cashews, lime wedges, and chopped green onion. Best when fresh. Leftovers keep covered in the refrigerator up to 4 days or in the freezer up to 1 month. Reheat on the stovetop until hot. *Prep time does not include cooking quinoa. *In place of the chili garlic sauce, you can also sub 1/2 tsp red pepper flakes or 1-2 hot chilies (per 2 tsp chili garlic sauce). So good! I’m working my way toward a vegan diet and this is the first “rice” dish that hasn’t had me miss the meat. Definitely re-doing this one. And sharing with friends and family. Thanks for your great recipes – they are helping me be so much healthier. This was so yummy!! Also, Salud Super Food in PV was a spot my boyfriend and ate at several times on our trip, ABSOLUTELY recommend that place to anyone traveling there! As for this recipe, I did double the broccoli (should have added even more honesty,) threw in some chickpeas, and added a bit of ginger and garlic powder to the sauce. It was a tad on the sweet side for me, so maybe next time I’ll omit the maple syrup or do half coconut aminos half light soy sauce? Suggestions on that welcome! I think some additional veggies would be nice too.. the cabbage and baby corn mentioned in other comments sounds great. Definitely making this again though, and likely very soon! Tasty and comforting, thanks for this! So delicious! Followed the recipe as is, and it is perfect! Topped it with some sesame seeds and more cashews. Just made this for dinner and my husband and I both LOVED it!! We used Tamari and added raisins. Might even try pineapple next time. We’ll be adding this to our weekly rotation, thank you!! So glad you and your husband liked it, Martha! Thanks for sharing your modifications! This was incredibly tasty and so easy to make – my husband and I felt like we were eating takeout! This is one of my favorite recipes we’ve made so far! Do you need to use white quinoa for this? Can you use any type ? Thanks ! I added red pepper to mine and it was fantastic! Very quick and easy and so many ways to modify with different vegetables. This will definitely be a staple for me. Tasty Tasty! Great basic blueprint for fried quinoa – thank you! I used Carrots, Bok Choy, Tofu and TOTALLY switched up the sauce. I had just made a miso-carrot sauce before I looked at this recipe so I decided I would use that instead. It totally worked! My only problem was getting the quinoa crispy. It seemed like it the quinoa wanted squish into the pan instead of fry – so my result was more of a veggie stir-fry with warmed quinoa and sauce. 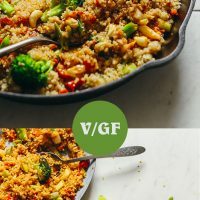 Any tips on how to really get that golden fry on the quinoa (or rice) ?? Maybe I just need to crank the heat. I was also using a cast iron skillet. Cheers! We’re glad you enjoyed this dish, Brandon! As for the heat, I’d recommend just cranking it up a bit. Hope this helps! I made this for dinner last night, and we loved it! My husband said, that was a very tasty dinner in a very satisfied time! I have used many of your recipes over the past few years, and enjoy them. Keep up the good work and your enthusiasm!! Hello, I’m a huge fan of your page, I’m currently making this dish , What can I use instead of chili garlic sauce ? I wasn’t 100% in love with this the first time I made it, but then I added about double the veggies and 1.5x the sauce and fell in love with it! I think its a great base recipe as written; my personal preference is just for more veggies and sauce because I wanted it to be more of a main than a side. I also added white onion I had leftover and that was great in it too! Easy to make – a good one when you don’t feel like making a big effort but still want something tasty and healthy. I’ve been meaning to make this one for a while, and now I’m glad I did. Just made this, it’s absolutely delicious, thanks for the recipe!! I used frozen, pre-cut vegetables to speed things along (baby corn, carrots, water chestnuts, broccoli), and it was the perfect weeknight dinner, I was finished in 15 minutes!! I’m just starting to transition to being vegan, and I’m so glad I found your blog! Keep up the great work!! Made this tonight, didn’t have any nuts so I used red quinoa to make up some of the crunch and added some black sesame seeds on top. Made some of the crispy peanut tofu to go with it, using almond butter there too rather than peanut butter. So good!!! I’m new to eating vegan and your blog has been super helpful for easy recipe ideas!! I made this tonight for me and my non-vegan husband and we both loved it! The sauce was amazing and it was super filling. Will definitely make again with more veggies and maybe some tofu! I made this recipe last night, my partner does not like quinoa so I am looking at different recipes to find a few he likes. We are in transition to a plant-based lifestyle. He liked this recipe! I am so happy! This recipe was awesome, loved the sauce, the recipe is very easy to put together. I had cauliflower left over so I put that with the broccoli, also, next time I will add some black beans for added nutrients. But honestly, this recipe, as is, is amazing. I mesured out the quinoa, I think it is important because I noticed in other recipes that when i put too much quinoa, it is dryer and less tasty because there is not enough sauce. So thumbs up Minimalist Baker! I love your recipes! :) your recipes are so yummy, makes the transition easier. We are glad you are enjoying our recipes, Solene! question because i have this problem with making fried rice (using jasmine rice): do you have to slightly undercook the quinoa (rice) to not have it get mushy when pan-frying it? i am looking forward to trying this recipe! Hi Rina! Provided you follow the instructions, you shouldn’t run into mushy quinoa rice! I made this for dinner last night and it was delicious! I added chickpeas also for extra protein. Will have to experiment a little with the flavors in the sauce to balance it out more, but generally it’s a great quick weeknight dinner thaf will be cooked on repeat! Great addition, Jamie! We are glad you enjoyed the recipe! Can you please confirm if the seseme oil you use in cooking is toasted or not? I made this and it just didn’t work for me. The sauce had a combination of flavors that I wasn’t really used to. I just thought it tasted…weird? I used soy sauce instead of aminos and had to scale it down a lot because of the saltiness. But with the soy + nut butter + lime + maple, my taste buds didn’t know how to feel about it. The quinoa also didn’t crisp up in the pan, it just got stuck to the bottom. I did enjoy the combo of veggies, cashews, and quinoa together, but I think would’ve preferred it with maybe just some soy sauce on top. Overall, not really what I was expecting/wanting from this recipe, however a lot of it was probably just preference. Hi, I made this today – it was delicious! I used tamari instead of coconut aminos but otherwise made this as per the recipe. I washed the quinoa and toasted it for 2 minutes as per the instructions. While it was tasty, I couldn’t seem to get the crunchiness, even after leaving the quinoa for a couple of minutes at the bottom of the pan to get crispy at the end. Any tips on how I can get the quinoa to become crispy/crunchy? Should I be toasting them for longer at the start? Thank you! Hi Mits! We’re glad you enjoyed this dish! For more crunch, we recommend adding some cashews! Was so easy & so flavorful! Definitely going in my weekly rotation. We didn’t have any limes on hand but it still was super tasty. Made this tonight and loved it! We’re not vegan but vegan cooking is probably my fav to make and eat. I think because we’re used to meat, a lot of vegan dishes leave us feeling very hungry after an hour or two. I really amped the cashews in this dish and I’m happy to report that I still feel very satisfied after 3 hours! Made this for dinner tonight and it was amazing! So easy. I followed the recipe exactly except I used Tamari instead of aminos. I loved the cashews as well such a great addition. I topped it with some fried tofu! Thanks Dana! Glad you enjoyed it, Allison! This was easy and DELICIOUS!! So good in fact, that I would recommend doubling the sauce! Highly recommend! I made this last night for dinner, and it was SO good! It’s so flavorful and I love the crunch added by the cashews. I made it with the Sticky Sesame Cauliflower recipe from Chocolate Covered Katie’s blog, so I left the broccoli out of the fried quinoa and added some peas instead. I absolutely will be making this again! Lovely! Thanks for sharing, Bethany! This was so excellent !! I added zucchini and took out the nuts and maple syurp (allergies) and it turned out fantastic! I used the red pepper flakes As the recommended substitute for the chili sauce. Will definitely make this again ! Woot woot! Glad to hear it, Raquel! Had to leave out anything spicy for the kiddo, but it was still amazing. Super filling. Probably making it again tomorrow for my lunches this week b/c I’m now a liiiiiitle bit obsessed. (Recipe above just made enough for the 3 of us as a main.) Used the freezer/microwave quinoa and worked just fine (although I didn’t get the crispy quinoa you mentioned from the pan. Still great.) Love all the veggies in it. Only watch out: not to eat it so often I get sick of it. Ha. We are glad you enjoyed it, Amy! I made this and added the tempeh and it was great! Definitely will be adding it to the rotation, and it seems like it would be easily customizeable with different veggies. Totally customizable! Glad you enjoyed it, Leah! So delicious! I only have one cup of quinoa in kitchen today so I put that and a can of black beans in it to stir as well. Still a good taste! Ah, so kind! Thanks, Kelly! I just made this! It was absolutely delicious. I subbed tamari for coconut aminos and used a little less. I used soy sauce instead of coconut aminos, and reduced it by 2 1/2 tablespoons. I still found the end product too salty to be eaten along so I would probably use 2 tablespoons less next time! However, it is so flavorful and easy. It is now perfectly salty to be use as a lettuce-cup or taco filling. Definitely going to make it again! Lovely, thanks for sharing! Coconut aminos is less pungent in flavor and saltiness in my opinion, so if using soy or tamari starting small and working your way up to taste can be helpful. I meant to make this just like it said but I used farro and I’m pretty sure I doubled the broccoli (a happy accident!). I wanted to use quinoa but realized I only had half a cup! Farro isn’t as nutritious as quinoa (right?) but it was darn tasty! Great recipe! Farro is great! Sounds like you made great modifications. Thanks for sharing and for your review! Hey! Looking over the directions, at what point do you add the sauce? Can’t wait to try this but what chili garlic sauce did you use? Did you make your own? I always use Huy Fong foods! Lovely – thanks for sharing, Jamie! This was a delicious recipe! My family loved it. Thank you. I will be making again . This is a great recipe that I can see us using as a staple especially during the CSA months when we need to throw a low of veggies together! I subbed the broccoli with snow peas and added kohlrabi and some garlic scapes because that’s what we had, as well as tamari for the coconut aminos. Scaled back on the spice so the 2.5 year old would eat it. I could see us adding tofu as well in the future. Delish!! I’ve honestly never been a huge fan of rice…but I love quinoa! Can’t wait to try this; I know I will love the sauce too! I did some twerking, though, partially because I’m kinda unable to follow directions and also because I don’t like the charred taste that sometimes brocoli get when they get tossed into the wok. So, I steamed the carrots and brocoli before, and used soy sauce instead of coconut aminos. So, I use sprouted quinoa that doesn’t need to be rinsed. If using unsprouted, yes it’s always a good idea to rinse. Even if wet, you can still toast the quinoa. I’ll add that to the instructions – thanks! I made this for my first dinner after a 28 day all raw fruit and veggie cleanse. It was unbelievable. I substituted, summer squash & zucchini cut into quarters…(I didn’t have carrots) and added a can of baby corn… the colors were all green and Yellow, but man the flavor is out of this WORLD!!! The sauce was the big kicker!!!! Thank you so much for this delicious recipe. 5 stars. Yay! Thanks for sharing, Gabriella. Lovely! Thanks for sharing, Katie! I made this twice yesterday! The first batch was eaten immediately by us 4, which left nothing for the 5th family member who would be home soon. I had extra quinoia so I made a double batch the second time. I ran out of green onions after using them in the sauce, so I sauted a red onion with the carrots instead, still yummy. I did add an extra tablespoon of peanutbutter to the sauce. I thought the dish was very homey, felt like eating Sunday dinner’s growing up… just felt good in your mouth. I found my coco aminos at Costco, and my girlfriend got hers at Trader Joe’s. Its a little sweeter than soy sauce with simpler ingredients, and no wheat. Also, chili garlic sauce is the bomb! Super delicious! I threw some red cabbage in there, too. And some extra spice, because I like things spicy. I think in the future I might chop up a clove of garlic as well, as I think it could add a little flavor to it. But overall, we loved it! Quick and filling dinner. Ooh smart! Thanks for sharing! I have to try this. I’m always looking for more ways of eating quinoa. I absolutely love quinoa! I am going to make this for my family, hoping my (<2 yr old) will eat it. Any substitute ideas if I want less spicy for the chili garlic sauce? I would probably just omit it or scale way back! Upping this protein content, would you advise something like chickpeas or beans? I think chickpeas would be lovely! Or even firm tofu. I will be making this for dinner tonight! Looks delicious and hearty on these old nights. Another recipe of yours to add to my collection! Who said vegan cooking was boring and bland? ?? That looks so good. I am going to try it this week, but I’ll substitute asparagus for the broccoli as my wee boy doesn’t like broccoli. My mouth was actually watering as I scrolled down the page. Thanks for the recipe. Oh! I need to make this asap!!! But I don’t have any coconut aminos, can I sub tamari? How much should I use then? Totally! Tamari! You can scale back a little at first since tamari can be more potent than coconut aminos. And build up to taste. Let us know how it goes! Dang, how have I never thought of getting quinoa toasty?! I bet that’s insanely delicious and can’t wait to try this one! Hey Dana, what would you use instead of coconut aminos? Thanks!